Vision, Perception, and Cognition, Fourth Edition is a concisely structured text that expertly addresses clinical reasoning and decision making for the entire evaluation and treatment process of the adult with acquired brain injury. Provided are theoretical information, guidelines for both static and dynamic assessment, information on specific standardized evaluations, guidelines for adaptive and restorative treatment based on described theoretical and evidence-based information, and information on environmental impact of client performance. 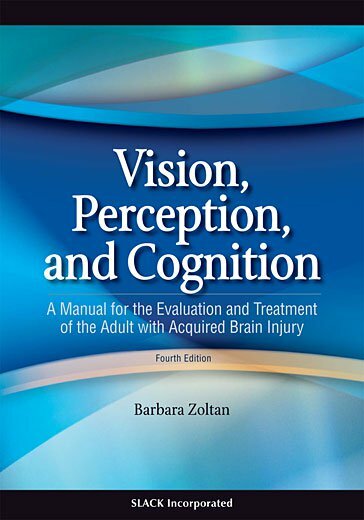 Inside this best-selling book, Barbara Zoltan, MA, OTR/L addresses visual, perceptual, and cognitive evaluation and treatment, providing structure, clarity, and content suitable for both students and experienced clinicians. Updated and expanded to reflect current practice and relevant research, Vision, Perception, and Cognition, Fourth Edition is a unique resource that takes the reader from theory to practice in a practical and detailed way. Students and clinicians will benefit from the numerous tables, figures, and extensive references presented throughout the text, as well as the inclusion of a glossary, for easy reference to terminology used throughout Vision, Perception, and Cognition, Fourth Edition . Faculty will be impressed by the addition of an on-line instructor's manual for additional classroom learning objectives and activities. Whether you are a student or clinician in the area of occupational therapy, physical therapy, neuropsychology, optometry, or speech pathology, Vision, Perception, and Cognition: A Manual for the Evaluation and Treatment of the Adult with Acquired Brain Injury, Fourth Edition will continue its over 35 year tradition to be an invaluable resource for exploring theory and practice in the evaluation and treatment processes. "This book is affordable, and although aimed at occupational therapists, it would be useful for physiotherapists specializing in neurological rehabilitation, and health professionals who wish to understand more about visual, perceptual and cognitive functioning." "This is a very well researched and referenced text that effectively integrates the author’s many years of experience with research evidence. It provides the student and practicing clinician with many helpful resources, including specific standardized assessments, occupationally based assessments and dynamic assessments as well as additional references to consult for further reading. As each chapter addresses a particular set of deficits and skills, clinicians can also quickly refer to specific chapters of interest as questions arise in their practices." "The strength of the book lies in the chapters relating to cognitive-perceptual functions, most of which provide sufficient (but not overwhelming) background material on the function, highly detailed descriptions of evaluation methods, and moderately thorough reviews of treatment interventions. The best discussions relate to evaluation and assessment measures, each of which is a highly detailed set of guidelines that clinicians can readily follow in their patient care activities. This is a useful book for practicing clinicians and students in rehabilitation therapy disciplines, providing the appropriate theoretical and scientific support for certain clinical activities, but mostly providing extensive, detailed, and easy-to-follow guidelines on clinical assessment techniques for patients with cognitive, perceptual, and visual dysfunction. There are several new clinical techniques discussed in this edition that were not included in prior version." — Elliot J. Roth MD, Rehabilitation Institute of Chicago, Doody Enterprises, Inc.
Barbara Zoltan, MA, OTR/L is a consultant in Southern California. She obtained her bachelor's degree in Occupational Therapy from Tufts University and her master’s degree from the University of Southern California. She holds certifications in both sensory integration and neurodevelopmental treatment and has served on the editorial boards of the Journal of Head Trauma Rehabilitation and Occupational Therapy in Health Care . Her more than 20 years of experience specializing in neurological rehabilitation has included a broad range of research, teaching, administrative and clinical practice. She has published over 20 articles, chapters, and books related to the adult with acquired brain injury. Instructors: Visit our new website especially for you at efacultylounge.com! Through this website you will be able to access a variety of materials including, Vision Perception and Cognition, Fourth Edition , Instructor’s Manual. Available on-line, this exciting manual provides additional learning and activities for each chapter including key terms, and specific learning objectives.